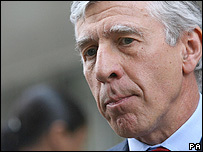 Justice Secretary Jack Straw has said a Bill of Rights and Responsibilities is needed to ensure British values are "better understood". He said such a document could foster a "stronger sense of citizenship" in an era of rapid population change and ongoing security threats. The government would be unveiling ideas about what should be in it "over the coming months," he added. The Tories and Lib Dems say Labour has already destroyed key liberties. The idea of a Bill of Rights is at the heart of Prime Minister Gordon Brown's plans to reform Britain's constitution. Mr Straw said such a document should establish "the balance between rights we are all entitled to and the obligations we all owe to each other". But, in a speech to Cambridge University's law faculty, he also stressed the need for a public debate, saying "it is vital it is owned by the British people and not just the lawyers". He also mounted a strong defence of the Human Rights Act, which incorporates into British law the European Convention on Human Rights. He rejected Tory proposals for the Act to be scrapped in favour of British Bill of Rights, arguing that such a move would weaken British justice and risk putting the country in breach of its international obligations. It would also lead to delays as people were forced to seek justice in the European courts, added Mr Straw. In a Commons statement earlier, Mr Straw unveiled the next step in the government's moves to reform Britain's constitution. He launched three consultation documents - on giving MPs the final say on sending troops to war, changes to the way judges are appointed and lifting restrictions on protests near Parliament. Mr Straw said the government would also publish an annual national security strategy and pledged "new rules" to open up the work of the security services. He also proposed strengthening Parliament's role by putting the MPs' right to ratify international treaties on a statutory footing. And he signalled changes in the governance of the government's spending watchdog, the National Audit Office. On House of Lords reform, he said all-party discussions were continuing, but there were no new proposals announced. "I hope and believe the House will agree the matters I've raised today go to the heart of exactly where power should lie in our country and how it should be exercised," Mr Straw told MPs. But shadow justice secretary Nick Herbert, for the Conservatives, said the government's plans were a "recipe for a legal muddle". And he accused ministers of giving away key liberties through the Human Rights Act, arguing that it should be scrapped in favour of a British Bill of Rights. Tory anger was also sparked by the government's suggestion that a referendum on a written constitution or Bill of Rights would be "inevitable". They said such a move would be "extraordinary" in the light of a vote on the EU treaty being ruled out. Lib Dem justice spokesman David Heath welcomed Mr Straw's speech but said it "largely undoing the government's position of only a few months ago". "The Liberal Democrats have long argued against the royal prerogative in war making and treaties, limits on demonstrations in Parliament Square and further restrictions on freedom of information. "Sadly both the government and the Tories refused to listen. "What we are still waiting to hear are further reforms to make Parliament work better as a whole, and the promises to act to reinvigorate our democracy which must include a fair voting system."